There’s a lot of tools that can help you monitor your Wi-Fi status .Wi-Fi Monitoring Software will tell you how good is your Wi-Fi in terms of signal strength, range capabilities ,internet speed and so on. And if you will ask me what I am using, I will recommend Xirrus Wifi Inspector Tool, a free tool for Wi-Fi created by Xirrus.com, a Wi-Fi certified company that exist long ago. They offers a lot of Wi-Fi kit, Arrays, accessories (hardware) and freebies (softwares) to cater your needs. Back to Xirrus Wifi Inspector Tool, is free and powerful utility that works on Windows XP, Vista and Windows 7 as well as on Mac OS 10.5 or higher.XWI tool allows network administrator to manage,troubleshoot and test Wi-Fi network instantly. 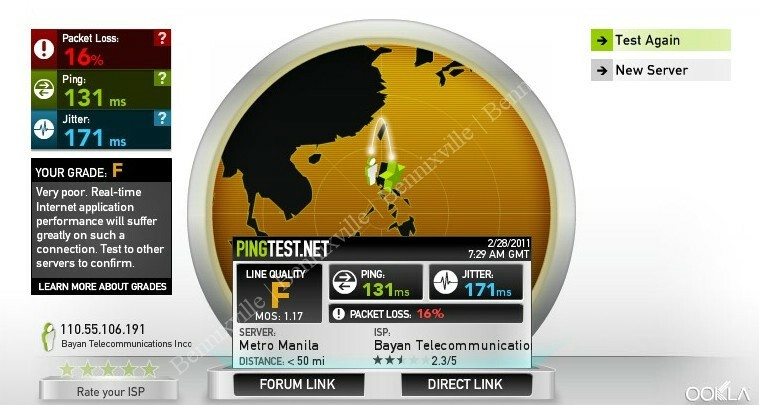 In the main menu, you will see the Radar figure that shows all the reachable Wi-Fi spot around your position with corresponding dBm. According to About.com, db is a standard unit for measuring the strength of Wi-Fi wireless radio signals. Decibels are also used as a measure for audio equipment and some other radio electronics including cell phones.While the “m” in dBm represent miliwatts of electrical unit.So, Wi-Fi equipment with a relatively larger dBm value is capable of sending or receiving wireless network traffic across greater distances. However, larger dBm values also indicate the WiFi device requires more power to operate, which translates to decreased battery life on mobile systems. 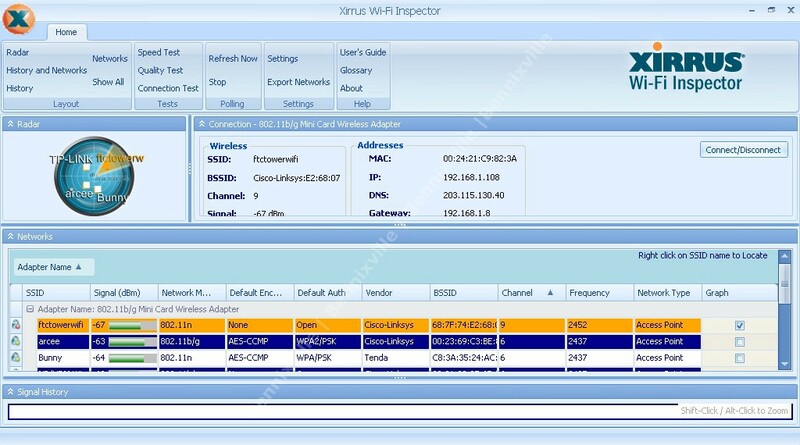 With Xirrus WiFi Inspector you can track the signal(express in dBm),network mode(802.11 b/g/n),Encryption, Authentication, Channel, Frequency and the Network type as well as the connection history of the Wi-Fi. 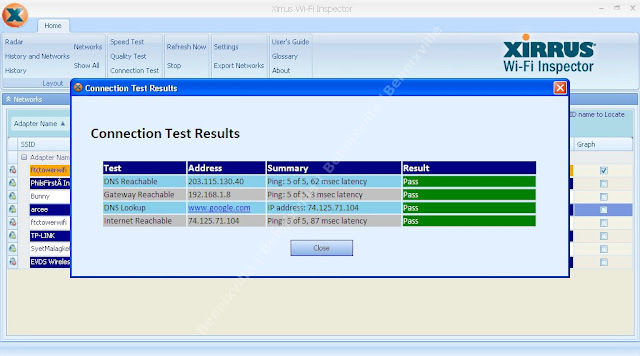 Another benefits of using Xirrus WiFi Inspector is the integrated test menu like speed test, quality test, and connection test. 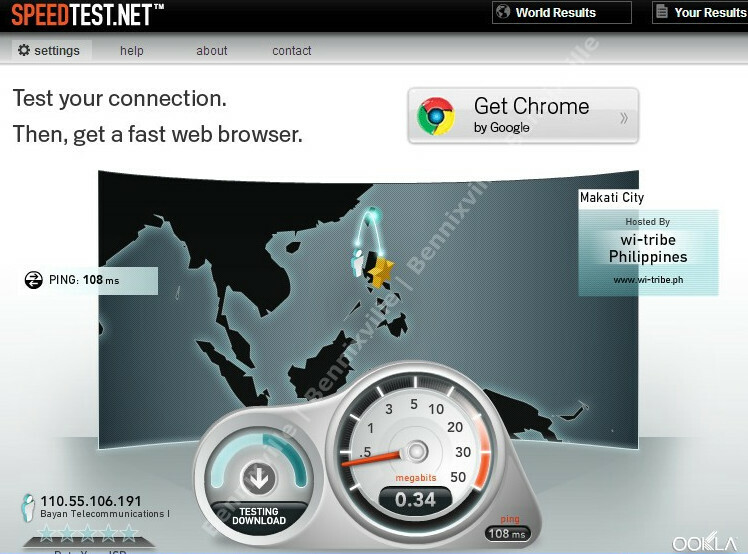 •Quality Test- Determine your real-time internet performance. •Connection Test- Just doing your common task of pinging Google but this time it will display some significant info. XWI tool you can also view some of the important addresses of the network like MAC , IP, DNS and gateway . If you wish to connect or disconnect to a certain Wi-Fi then you can use XWI as an alternative.I recommend this tool to be installed in your laptop, it works best. • Details on available Wi-Fi networks – SSID, channel, security, type, etc. Cons: No Network Map , Requires .Net Framework 2.0 on some machines, Requires Wireless adapter for desktop. 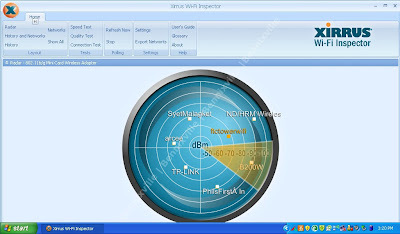 Try Xirrus Wi-Fi Inspector Tool and share to others! For installation guide,please read the manual.